Aims: To find the relationship of several physical risk factors on the occurrence of low back pain (LBP) over a period of 6 months among young sedentary individuals. Settings and Design: Yenepoya University, Mangaluru, India; prospective cohort design. Methods and Material: In this study, total number of 187 students of Yenepoya University, aged 18 to 30 years, with the international physical activity questionnaire (IPAQ) score of less than 600 metabolic equivalent (MET) minutes /week were recruited through convenience sampling. Participants were assessed for body mass index (BMI), hamstring and iliopsoas muscle tightness, abdominal and back muscle strength and endurance, and trunk range of motion (ROM) at baseline. All measurements were taken by using standardized procedures. Statistical Analysis Used: Frequency distribution, Karl Pearson's correlation test by SPSS. Results: The Logistic regression analysis showed that there was a significant positive correlation between low back pain and trunk flexion ROM with odds ratio of 1.671 (P < 0.001), LBP and trunk extension ROM with odds ratio of 1.602 (P < 0.001), LBP and abdominal endurance with odds ratio of 1.602 (P < 0.001), LBP and BMI of overweight with odds ratio of 1.534 (P < 0.001), LBP and BMI of obese with odds ratio of 1.429 (P < 0.001). Conclusions: The study shows that there is a statistically significant correlation between trunk flexion and extension ROM, abdominal muscle endurance and BMI of obese & overweight category with low back pain, among young sedentary individuals. Low back pain (LBP) is the most frequent musculoskeletal disorder. It is defined as “pain between the costal margins and inferior gluteal folds and usually accompanied by painful limitation of movement” LBP is ranked first as the cause of disability and the inability to work. It is found to occur at least once in a lifetime in about 90% of the world's population commonly in the age group of late teens to 30 years, defined here as young. The frequency of LBP is about 10%–25%, with an annual first-time incidence of 5%., Age, gender, occupation, recurrent weight lifting, weakness of abdominal muscles, obesity, smoking, increased lumbar lordosis and scoliosis are some of the known risk factors of LBP. A muscle is a potential source of LBP. Failure in the muscles protective function may cause excessive loading and damage to the pain sensitive structures due to poor muscle endurance of the trunk. This leads to the strain of its passive structures, early muscle fatigue and an inability to rightly respond to the demands of unexpected loads. Thus, enhancing back muscle strength and endurance could help reduce the occurrence of LBP. The younger generation is more obsessed with sedentary entertainment and spending hours with high-tech gadgets such as computers, cell phones, pure audio design along with prolonged sitting in class. The early recognition of sedentary lifestyle and its adverse effects can prevent the first episode of LBP and also minimize the economic burden of this chronic disease. Reduced physical activity is seen as a major risk factor for the development of chronic LBP. Teens who are physically less active are at a higher risk and more prone to suffering from LBP. There are several factors that contribute to LBP. The best method of preventing LBP is by early recognition and its intervention before its first episode. Thus, our understanding on the causes and nature of LBP needs to improve. The present study does not deal with LBP that result from any trauma, osteoporotic fractures, infections, neoplasms, and other pathologies. However, the exact cause of nonspecific low-back pain is still unclear and is a therapeutic conundrum. Previous studies have shown the influence of trunk muscle strength, range of motion (ROM), endurance, obesity, smoking, etc., on LBP. There remains a lacuna to determine this relationship in young sedentary individuals which could be an early indicator of this chronic disease. Thus, this study aims to determine and find the various physical factors that could influence a new episode or a recurrence of an LBP among young sedentary individuals over a period of 6 months. The prospective study was conducted among 187 individuals aged 18–30 years using convenience sampling. Before participation, written informed consent was obtained from each participant. Ethical clearance was obtained from Yenepoya University Ethics Committee (YUEC 186/19/09/2015). The inclusion criteria were the students of our institute aged between 18 and 30 years, the International Physical Activity Questionnaire score of <600 metabolic equivalent min/week were considered sedentary in this study. Active participants such as athletes, dancers, sports players, and pregnant women, individual with any musculotendinous injuries, history of recent surgery or fracture, neurological disorder, joint pathology, instability, spine pathology, immediate postoperative status and pain, and any pain that restricted movements of the upper and lower limb and trunk were excluded from the study. Standardized weighing machine (Kushagra 8MM Digital Thick Glass Weighing Scale, Kushagra International from New Delhi, India) measured the weight, and the stadiometer (200 cm Wall Mounted Height Rod Meter Stadiometer) was used to measure the height of participants. 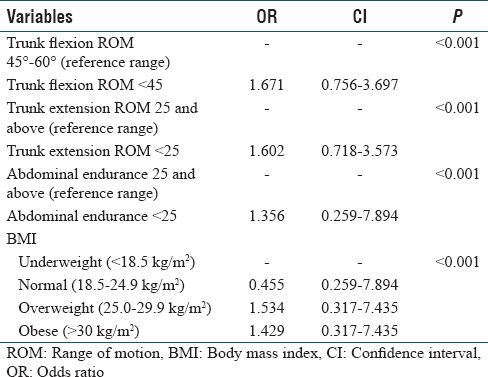 Body mass index (BMI) was calculated as BMI = weight (kg)/height (m 2) [Figure 1] and [Figure 2]. A 360° gravity inclinometer (AMP: 360° gravity inclinometer) was used to measure the trunk ROM. A standard perspex universal goniometer (Physiomed, Manchester, UK) was used to measure the hip and hamstring muscle flexibility. Participant laid supine with the knees bent over the edge of the examination table. He/she was instructed to have one knee flexed to the chest. The angle of the other hip was recorded using the universal goniometer to determine the tightness of the iliopsoas muscle. If the thigh was above the horizontal level tightness was present and the hip angle was recorded with a negative measure. The same procedure was repeated on the opposite hip. The average of three readings was recorded. The angle was noted but just Yes or No was used for statistical analysis  [Figure 3]. The participants were supine on a bench with their right/left knee and hip to 90°. They were instructed not to allow the femur to move at any point during the test. The participants were instructed to extend their right knee as far as possible, keeping their foot relaxed. The end position was held for 5 s, and the angle of knee extension was measured using a standard Perspex universal goniometer. Hamstring tightness was considered if the participant was unable to keep the hip flexed at 90° and the knee totally extended at 180° [Figure 4]. The participants were in supine on a bench with the hips at 45° flexion and knees flexed to 90° and hands at the sides. A line was drawn 12 cm distal to the fingers. The participants tucked in their chin and curled the trunk to touch the line with the fingers and repeat as many curls as possible using a cadence of 25 repetitions per minute. Score was recorded before cheating (i.e., holding breath and altered mechanics) or occurrence of fatigue  [Figure 5]. The participants were placed in prone lying position with the hips and iliac crest resting on the end of examining table and the hips and pelvis stabilized with straps. The examiner instructed the participants to extend the trunk to neutral and lower the head to the start position. The cadence expected was 25 repetitions per minute. The number of repetitions possible before cheating (holding breath, altered mechanics) or fatigue occurrence was recorded as the score  [Figure 6]. The participants were laid supine on a bench with hands clasped behind their head, they were asked to flex the trunk through complete ROM causing the trunk to curl-up until scapula is cleared from the couch. Participants were graded using Daniel Worthingham's manual muscle testing  [Figure 7]. The participants were laid prone on a bench with their hands clasped behind their head. The therapist stood to stabilize the lower extremities just above the ankles. The participant then had to extend the lumbar spine until the entire thorax is cleared from the couch (clears umbilicus). Participants were graded using Daniel Worthingham's manual muscle testing  [Figure 8]. 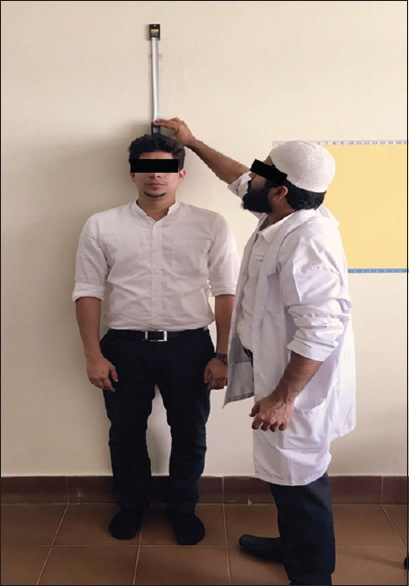 Isolated lumbar flexion active ROM (AROM) was assessed with the participants standing with their feet shoulder width apart and arms resting at their sides. Participants were asked to bend forward attempting to touch their hands to the floor while maintaining knee in extension. Once movement was ceased, the measurement on the inclinometer was recorded. Two measurements were taken one at T12 to L1 and the other at S1–S2. True lumbar flexion was calculated by subtracting measurements at S1-S2 from T12-L1. 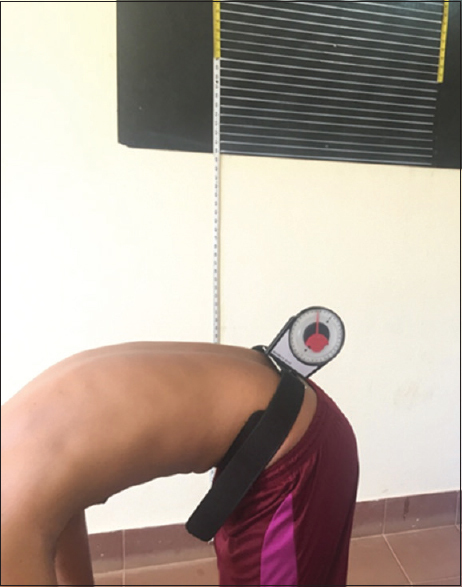 Similarly, Isolated lumbar extension AROM was assessed by asking the participants to bend backward as far as possible while maintaining knees in extension and the true value was recorded  [Figure 9] and [Figure 10]. Data were analyzed using SPSS version 22 (IBM Corp., Armonk, NY, USA). 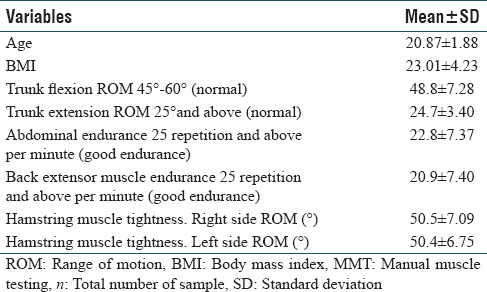 Descriptive statistics was produced for BMI, hamstring and iliopsoas muscle tightness, abdominal and back extensor muscle endurance and trunk ROM. The Logistic Regression was used to check the relationship between LBP and BMI, Trunk ROM, Abdominal muscle Endurance. The probability factor (P) < 0.05 was considered to be statistically significant. Among the 187 participants recruited, 14.4% were women and 85.6% were men with mean age of 20.87 (±1.88) [Table 1]. Among the young sedentary individuals, there was a significant positive correlation of LBP and trunk flexion ROM with odds ratio of 1.671 (P < 0.001), LBP and trunk extension ROM with odds ratio of 1.602 (P < 0.001), LBP and abdominal endurance with odds ratio of 1.602 (P < 0.001), LBP and BMI of overweight with odds ratio of 1.534 (P < 0.001), and LBP and BMI of obese with odds ratio of 1.429 (P < 0.001). Back extensor endurance, hamstring, and iliopsoas muscle tightness did not show any significant statistical significance [Table 2] and [Table 3]. Most studies on back pain among younger age groups largely focus on secondary-cause occurrences of the condition.,, Recent studies have shown that reduced physical activity is seen as a major risk factor for the development of chronic LBP. A sedentary lifestyle is considered as a risk factor for LBP among the general population, but it is also known that youths who do not practice physical exercise are far more likely to become sedentary adults. Previous studies have shown that trunk muscle strength, ROM, endurance, obesity, etc., can cause LBP. It is very important to study the young population because identifying LBP risk factors during the early phase of life can be crucial to preventing these individuals from developing acute lumbago at a later stage. The present study was done on 187 young sedentary individuals, who had no history of pain for the past 6 months. Forty-one individuals out of 187 reported episodes of LBP during 6 months. The present study observed that associations exist between LBP and some physical factors. Our results indicate that those sedentary individuals who are overweight and obese, having reduced trunk flexion and extension ROM and decreased abdominal endurance may be prone to LBP. In this study, however, the abdominal muscle strength, back extensor strength and endurance, iliopsoas and hamstring muscle tightness did not show any statistically significant relationship with LBP. In the present study, it was found that the participants with decreased trunk flexion ROM, i.e., below 45° are 1.67 times at a higher risk of LBP as compared to those with normal 45°–60° ROM and participants with below 25° trunk extension ROM are 1.602 times more likely to have LBP as compared to the normal 25° and above. A similar result has been found in a study done by Yaprak on the comparison of trunk ROM and physical fitness parameters in active females and sedentary females. The author found that the individuals with sedentary lifestyle have reduced trunk ROM and poor back health compared to physically active individuals and suggested that, for improving spinal flexibility and better back health, an active lifestyle is required. Another study done by Moradi et al., found that decreased lumbar flexion and decreased lumbar extension are positively associated with LBP. This study found that participants with below 25 abdominal repetitions are 1.35 times more likely to have LBP as compared to 25 repetitions and above. Koley et al., showed the correlation of nonspecific LBP (NSLBP) and aged-matched controls who found a positively significant correlations (P < 0.05) of abdominal muscle endurance with NSLBP. The present study found that participants under the overweight and obese category of BMI were 1.53 and 1.429 times, respectively, at a higher risk of developing LBP. A study done by Tremblay and Williams found a similar result indicating that obese adults are at a higher risk of developing adult LBP. Another study done by Booker found that approximately 35% of young adults are either overweight or obese, this study suggests that obesity is a predictor of LBP and associated with a longer duration of LBP. Another study done by Urquhart et al., showed that higher BMI was associated with higher levels of back pain intensity. The study done by Chaffin et al., supports the results of this study who found a negative correlation between trunk muscle strength and incidence of LBP. This result also supported by Mostardi et al. concluded that trunk muscle weakness did not correlate with the incidence of LBP. This study contradicts the findings of the study done by Lee et al., who reported that weak trunk muscle strength is one of the strongest risk indicators for the first-time experience of LBP. Several studies are done on the relationship between hamstring tightness and LBP. Although often showing conflicting results. Some studies done by Mellin et al. have shown trends toward hamstring shortness correlating with LBP, but no statistically significant relationships were found. The present study also showed all participants with hamstring tightness but it could not be statistically proved to show a positive association with LBP., A study done by Hellsing tight hamstring- or psoas muscles could not be shown to correlate to current back pain or to the incidence of back pain during the follow-up period. A study was done by Naveen et al. The results indicated that trunk extensors muscular endurance has negative influence over the pain and disability in patients suffering from chronic LBP. The present study also showed that there was no significant relationship trunk extensors muscle endurance and LBP. The study contradicts the findings of the study done by Hultman et al. in his study, it was noted that the risk of belonging to a population of patients who have recurrent or chronic LBP increased significantly when isometric extensor endurance was decreased in comparison with that in healthy participants. The study is limited to data from a single hospital and did not include an aged-matched control group to compare the findings with physically active individuals. The purpose of this study was to achieve a better understanding of the potential risk factors associated with LBP among young sedentary individuals. We conclude that strong statistically significant evidence exists for the association of reduced trunk flexion and extension ROM, decreased abdominal muscle endurance, overweight, and obese BMI values with LBP among young physically inactive individuals. However, the abdominal muscle strength, back extensor strength and endurance, iliopsoas, and hamstring muscle tightness was not found to be significantly associated with LBP. More high-quality evidence and research need to be conducted on the possible risk factors of LBP to validate these findings. We are grateful to all the study participants for their cooperation. We would like to express our special thanks to Soumya Shetty, Biostatistician, Medical College for assistance in statistical analysis. Tucer B, Yalcin BM, Ozturk A, Mazicioglu MM, Yilmaz Y, Kaya M. Risk factors for low back pain and its relation with pain related disability and depression in a Turkish sample. Turk Neurosurg 2009;19:327-32. Brennan G, Shafat A, Mac Donncha C, Vekins C. Lower back pain in physically demanding college academic programs: A questionnaire based study. BMC Musculoskelet Disord 2007;8:67. Taguchi T. Low back pain in young and middle-aged people. Jpn Med Assoc J 2003;46:417-23. Chok B, Lee R, Latimer J, Tan SB. Endurance training of the trunk extensor muscles in people with subacute low back pain. Phys Ther 1999;79:1032-42. Lu Y. Effects of Sedentary Lifestyle on the Development of Back Pain in Children and Adolescents (Doctoral Dissertation, The University of Hong Kong (Pokfulam, Hong Kong); 2012. Picavet HS, Schuit AJ. Physical inactivity: A risk factor for low back pain in the general population? J Epidemiol Community Health 2003;57:517-8. Moroder P, Runer A, Resch H, Tauber M. Low back pain among medical students. Acta Orthop Belg 2011;77:88-92. Andersson GB. Epidemiological features of chronic low-back pain. Lancet 1999;354:581-5. Clapis PA, Davis SM, Davis RO. Reliability of inclinometer and goniometric measurements of hip extension flexibility using the modified Thomas test. Physiother Theory Pract 2008;24:135-41. Jandre Reis FJ, Macedo AR. Influence of Hamstring Tightness in Pelvic, Lumbar and Trunk Range of Motion in Low Back Pain and Asymptomatic Volunteers during Forward Bending. Asian Spine J 2015;9:535-40. Magee DJ. Orthopedic Physical Assessment. 5th ed. St. Louis, Missouri: Saunders Elsevier; 2008. p. 540-3. Helen J. Hislop Jacqueline Montgomery Daniels and Worthingham's Muscle Testing: Techniques of Manual Examination. 7th ed. Philadelphia, Pennsylvania: Saunders; 2002. p. 38-48. Kolber MJ, Pizzini M, Robinson A, Yanez D, Hanney WJ. The reliability and concurrent validity of measurements used to quantify lumbar spine mobility: An analysis of an iphone ® application and gravity based inclinometry. Int J Sports Phys Ther 2013;8:129-37. Egwu MO, Mbada CE, Olowosejeje D. Normative values of spinal flexibility for Nigerians using the inclinometric technique. J Exerc Sci Physiother 2012;8:93-104. Yaprak Y. A comparison of spine ROM and physical fitness parameters in active females and sedentary females. Medicina Sportiva 2014;10:2462. Moradi V, Memari AH, ShayestehFar M, Kordi R. Low Back Pain in Athletes Is Associated with General and Sport Specific Risk Factors: A Comprehensive Review of Longitudinal Studies. Rehabil Res Pract 2015;2015:850184. Koley S, Kaur J, Sandhu JS. 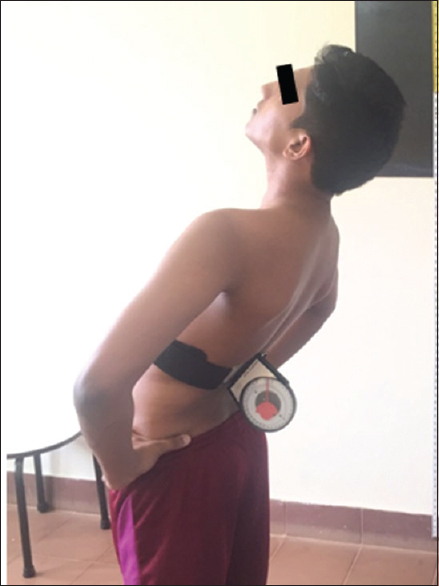 Biological risk indicators for non-specific low back pain in young adults of Amritsar, Punjab, India. J Life Sci 2010;2:43-8. Tremblay MS, Willms JD. Is the Canadian childhood obesity epidemic related to physical inactivity? Int J Obes Relat Metab Disord 2003;27:1100-5. Booker KS. Existing strategies that assist in prevention of low back pain in the college student. OpenSIUC 2014; Research Papers. Paper 486. Available on:http://opensiuc.lib.siu.edu/gs_rp/486. [Last accessed on: 2017 Mar 25]. Urquhart DM, Berry P, Wluka AE, Strauss BJ, Wang Y, Proietto J, et al. 2011 Young Investigator Award winner: Increased fat mass is associated with high levels of low back pain intensity and disability. Spine (Phila Pa 1976) 2011;36:1320-5. Lee JH, Hoshino Y, Nakamura K, Kariya Y, Saita K, Ito K. Trunk muscle weakness as a risk factor for low back pain. A 5-year prospective study. Spine (Phila Pa 1976) 1999;24:54-7. Sweetman BJ, Anderson JA, Dalton ER. The relationships between little-finger mobility, lumbar mobility, straight-leg raising, and low-back pain. Rheumatol Rehabil 1974;13:161-6. Mellin G. Chronic low back pain in men 54-63 years of age. Correlations of physical measurements with the degree of trouble and progress after treatment. Spine (Phila Pa 1976) 1986;11:421-6. Hellsing AL. Tightness of hamstring- and psoas major muscles. A prospective study of back pain in young men during their military service. Ups J Med Sci 1988;93:267-76. 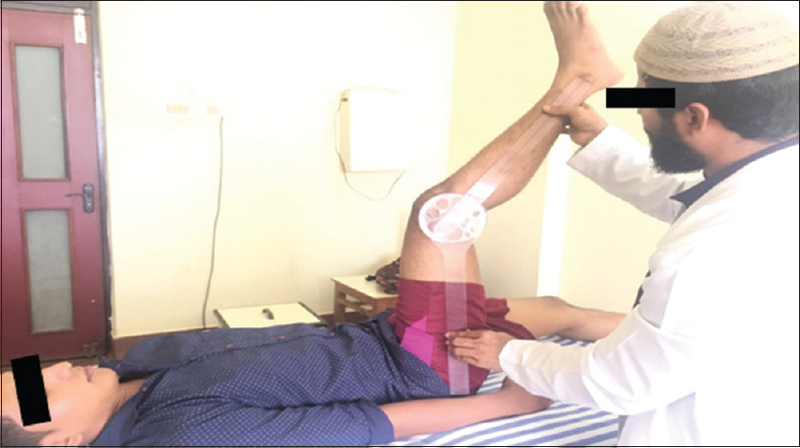 Naveen G, Manoj M, Kulandaivelan S. Correlation of trunk extensors endurance with pain and disability in patients with non radiating chronic low back pain. Int J Physiother Res 2014;2:329-33. Hultman G, Nordin M, Saraste H, Ohlsèn H. Body composition, endurance, strength, cross-sectional area, and density of MM erector spinae in men with and without low back pain. J Spinal Disord 1993;6:114-23.